However, secretly anyone who really knows me, has always known of my deep and somewhat rebellious love of dandelions. A favorite? perhaps. 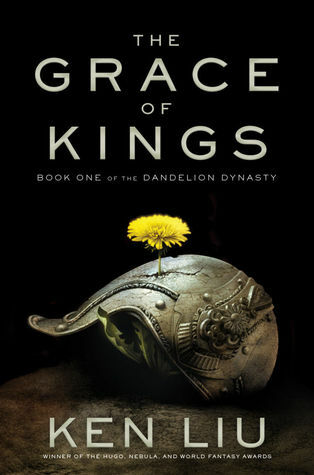 So when I saw on the spine of this book ” BOOK ONE OF THE DANDELION DYNASTY” it certainly piqued my interest. Then I saw the stunning cover……. Oooh! Pretty! I finally decided to read this one, with nothing more to go on, and I wish I wouldn’t have waited so long. My beloved weed makes an appearance several times, always along side wisdom. I do hope the eloquent pen of Mr. Liu can convince many more to love the humble little plant as I (and Jia) do. The story is reminiscent of A Game of Thrones, but instead of having that medieval-ish feel, it’s more Asian. It’s a beautiful and tragic, epic play for power. A fight for the right to rule the lands of Dara, a recently united group of city states or small countries. We begin with several major contestants for the crown, and eventually narrow it down to just a few. Each of Dara’s little areas have distinct cultures, worship distinct gods and trade in their own types off goods. It is difficult to write about the plot without giving too much away, but I think, like in A Game of Thrones, you’ll choose your favorites quickly and root for them, unless they fail, and then before you know it a new favorite character will have won you over. Idealistic warrior, female general, unruly and fun loving rebel? There are just too many great characters to choose from. I expect this pattern to continue into the next book too. Only maybe (and the author does hint) that it just might be a battle of wits and will of the strong (but so far minor) women next…I’m excited! Already read The Grace of Kings and want to know more? Many of the concepts presented in the book mirror Qin Dynasty history, for one of the best sources of information about the Qin Dynasty, I’d suggest reading Records of the Grand Historian: Qin Dynasty by Sima Qian. The game of cupa as played by Mazoti, I believe to be based on the ancient game of Go or Weiqi. It’s challenging and fun. Try Go for Beginners by Kaoru Iwamoto or for a more cultural perspective of this fascinating game, a moving novel, The Girl Who Played Go by Shan Sa. Or maybe take a break from reading, enjoy the summer by getting outside, making a few dandelion crowns then snacking on one of my favorite dandelion recipes from LearningHerbs.com and the amazing herbalist, Rosalee de la Foret: Dandelion Fritters. Yum!